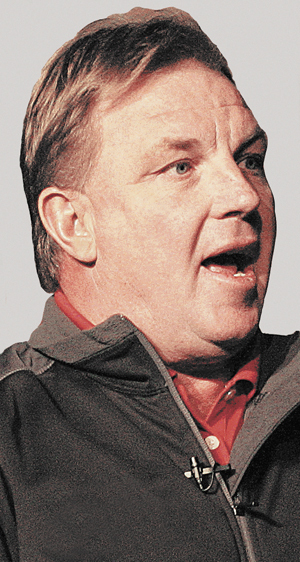 WICKENBURG, Ariz. — One of the most annoying things coaches hear from players is excuses. The smart players never go there. They focus on excellence every day of their life in every facet. If they have setbacks in games, they work to get better. The excuse makers should study David Stevens, one of the most unbelievable baseball players the game has ever witnessed and a young man I had the pleasure of interviewing during in the 1982 season. He played baseball without legs. 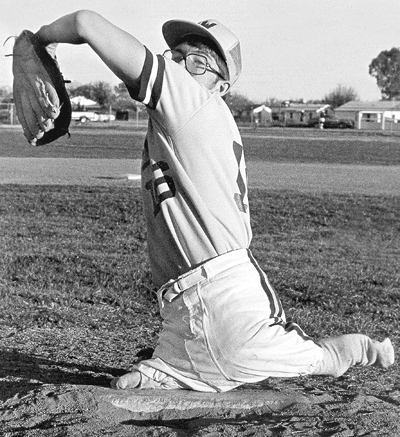 The Wickenburg High School (Arizona) sophomore was a thalidomide baby, born with stumps instead of legs. At the age of 16-year, he participated in several sports, including baseball, by running on the palms of his hands and his leg stubs, one a misshapen foot with two toes, the other several inches of fused toes. It goes without saying that he played with moxie and pain — with the determination of a lion. His story could have been tragic, but David’s indomitable spirit, to the amazement of everyone he knows, lifted him to remarkable deeds. At birth, he was given a slim chance of living without brain damage. He defied the odds. His mother, believed to be 15 or 16 years of age at the time, abandoned David in a Phoenix hospital. Fortunately, a loving couple by the name of Bill and Bee Stevens adopted young David at the hospital. David looks back on those days without any animosity toward his birth mother. He still would like to meet her some day. This 16-year-old sophomore played baseball and other sports with a zest unequaled anywhere. That’s because he was just happy to be alive and lived every day like it was his last. He normally walked on artificial legs. But for sporting events, he used the palms of his hands and his leg stubs to maneuver. Here is a sample of his athletic drive. During the junior varsity football season at Wickenburg H.S., David played nose guard in eight games. He was involved in seven unassisted tackles and one quarterback sack. As a first-year wrestler, he registered an amazing 10-11 record. He has bench pressed 208 pounds. Once during a physical education basketball class, he scored 22 points. So it’s not a case where coaches or students feel sorry for David. He has legitimate athletic talent. In varsity baseball games, he is usually put into a contest in the late innings of a tight game because he draws walks. When home plate umpires saw David bat for the first time, they always had difficulty figuring out his strike zone. But they normally allowed the strike zone to be about an inch above home plate that extended about 16 inches above that since he had no legs. Stepping to the plate, he used a Louisville Slugger 27 ounce bat that was about 2 ½ feet tall. To read more of this story, purchase the March 11, 2016 edition or subscribe by CLICKING HERE. BEAUMONT, Tex. — For the better part of 38 years, head coach Jim Gilligan has been the face of Lamar’s baseball program. The skipper has influenced the program since his playing days back in 1967 and recently announced that he will retire at the conclusion of the 2016 season. Last season, he accomplished something that only 18 NCAA coaches in history have done by capturing his 1,300th career win. 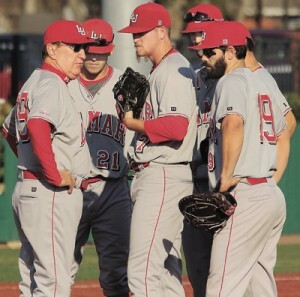 Gilligan has been a master at teaching pitching throughout his career and was a former pitching ace for Lamar from 1967-68. “I have gone through a couple of evolutions with my thoughts on pitching through the years. “In the early ’70s, Bob Shaw was one of the pitching gurus at the time. I remember going to a clinic in Chicago, and his big thing was not allowing the lead lift leg in pitching to go past parallel to the ground. He then said to tuck the front shoulder, look down in the strike zone and pitch. It was a technique for getting pitches down in the zone. “But it probably took three miles per hour of velocity off pitches. This spread like wildfire across the nation as velocities went down. Everybody was sort of bound up even though they were getting pitches lower in the zone. “Then Nolan Ryan comes along and simply states that the higher his lead leg goes up, the harder he throws. He gave everyone permission to have big windups again as velocities went up. His left knee went so high that it nearly touched his left shoulder. “If you look at the pitching mechanics of old Hall of Famers such as Bob Feller and Warren Spahn, their arms came back over their heads to start the pitching windup. Then the arms swung down and to the sides of their legs and back and then started forward again before the lead leg was picked up. “There were a lot of little guys who could throw pretty hard in that era. “Then pitchers started having the windup start with their hands near their stomach as these big windups went away for the most part. To read more of this article, purchase the March 11, 2016 edition of Collegiate Baseball or subscribe by CLICKING HERE. It includes a great lesson he learned from former Atlanta Braves’ pitching coach Leo Mazzone as far as bullpens and why max effort bullpens may be hurting pitchers today, why a street was named after Gilligan in Beaumont, Tex. and how the Salt Lake Trappers set a professional record by winning 29 consecutive games when he was the coach. Incredible System Utilized At Parkview H.S. LILBURN, Ga. — Chan Brown is one of the elite head baseball coaches in the USA at Parkview High School in Lilburn, Ga.
His teams at Parkview have won three Georgia state titles on the highest level (6-A) in the last five years and won two national titles in the past four years (2012 and 2015). None of these accomplishments have happened by accident. It has taken place by meticulous preparation to detail by Brown and his staff of eight assistants as the team essentially works 12 months a year on their game in one form or another. An incredible feeder system has been orchestrated by this remarkable coach as travel teams going down to the age of eight are taught everything about the game of baseball by his staff. Those players ultimately come to Parkview H.S. It isn’t unusual having young men involved with the Parkview way of playing baseball for 10-11 years. Brown is also an adept fundraiser as he annually brings in $100,000-$150,000 depending on travel costs for the year. But more about that later. Parkview was ranked No. 1 in the nation at the end of the 2015 season by Collegiate Baseball after rolling to a 34-2 record and capping the season with a 26-game winning streak. The 2015 Panthers hit .340 and stole 97 out of 113 bases. The pitching staff had a microscopic 1.52 ERA over 36 games and struck out 214 batters with 61 walks. The defense only committed 28 errors over 36 games. “More than anything else, I feel our program is about blue collar workers,” said Brown who is famous for his 6-hour practices early in the spring prior to games starting. “It is incredible how hard my kids work. We have had at least one player drafted 12 years in a row and average 6-7 players a year who sign with colleges and had as high as 10 in a given year. 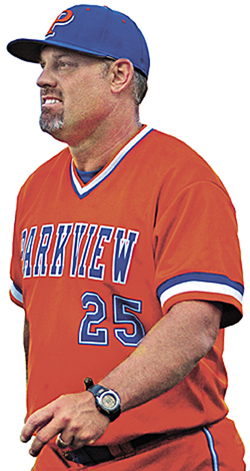 Entering his 13th season at Parkview, Brown said eight years ago he felt there was a need to incorporate a feeder system for the baseball program. “What I did was go to our local park (Mountain Park) which had baseball travel teams all the way from age 8 to 14. Our coaching staff became involved with those players and worked with them in the fall and winter to prepare them for high school down the road. 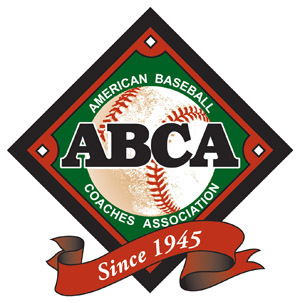 “We are now receiving players who have been getting instructions during their travel ball years from our coaches and myself for almost nine years. Some of these young men have worked with us for 10 or 11 straight years. “We work with every age group for an hour and 15 minutes during the fall once a week for six weeks. During the winter, each age group hits for an hour and a half a week. Essentially, these kids go through a 12-week program with us each fall and winter. “We are teaching them our drills and our terminology. Everything is obviously age appropriate. As they get older, we challenge them a bit more. We also watch them play games during the spring as well. So the kids see us around and get excited about being involved with our program down the road at Parkview High. To read more of this article, subscribe or purchase the Feb. 26, 2016 edition of Collegiate Baseball by CLICKING HERE. The rest of the article delves into why incoming freshmen are already on a Parkview summer team just prior to their freshman year, their intense weight training, swimming program and speed and agility workouts. Plus it explains Parkview’s unique drills and 6-hour practices that take place just prior to the season. In addition, the article explains how Parkview H.S. generates from $100,000-$150,000 annually. MONTGOMERY, Tex. — In 2003, we created the Athletic Pitcher Program™ and began down a road of performance enhancement and velocity creation for baseball athletes. Initially inspired from the work of Setpro engineer Paul Nyman, we have experienced firsthand the bumps and obstacles of such a track over the past 13 years. It has been an amazingly challenging and fulfilling ride. On our journey, we of course have failed many times. We have figuratively chased the wrong rabbit down the wrong hole. We have made assumptions and inferences that have since proven to be incorrect or overstated. On the positive side of the ledger, through those very failures we have learned, adapted and grown tremendously. We have succeeded beyond our wildest imagination. As the baseball universe’s understanding and sophistication of player development has grown tremendously over that time, so has the utilization of performance enhancement and velocity enhancement programs. Just one example of this growth was our rather primitive and rudimentary utilization of over-weighted and under-weighted balls in 2003 that was actually viewed at that time as edgy and dangerous. Now the practice is common place at every level of baseball including several MLB teams. The purpose of this article is to share three primary things we have learned over these past 13 years with regards to velocity enhancement that might help maximize your efforts and just as importantly minimize the risk of injury or training corruption. In 2016 it is not difficult to find velocity enhancement programs on the web that promise amazing results. While I have long since stopped searching for and/or critiquing such programs, I will tell you that many of them are solid and some of them I believe are very, very good. While of course there are several that are not worth the paper to be printed on, I wanted to direct my efforts on some critically important distinctions to make while embarking on this path of velocity enhancement. We intuitively know that one size will not fit everyone. One size won’t even fit one person forever. As we grow, develop and change, so do our needs, strengths and limitations. One size fits all programs are popular because they are easy to implement. Unfortunately efficiency is not the same as effectiveness. Designing a program customized to the individual athlete is often a daunting task, but the results are always worth the extra diligence. I see the following scenario play out again and again in this arena. Let’s say 10 young men engage in a generalized velocity enhancement program taken from a hot new program of the month on the web. The participants in Group A (3-5 athletes) make tremendous gains and are subsequently thrilled and excited. Group B subjects (3-5 athletes) make little or no gains and are slightly disappointed by the process. Group C (2-3 athletes) actually regress, experience pain or discomfort or (even worse) become injured. Those results often spawn predictable reactions that play out on message boards, chat rooms and twitter feeds. The success stories of Group A are trumpeted by the program’s author, and testimonials are offered as proof positive of the incredible efficacy of the program. Group B quietly accepts the fact that this program might not have been the right fit, or maybe they just somehow didn’t quite do everything that Group A did. Group B now begins the search for the next hot program of the month on the internet. Group C feels duped or betrayed and blames the program. The interactions often get incredibly vitriolic and nasty. Each competing program heralds their achievers as undeniable evidence of the superiority of their process while often discounting their underachievers or malcontents as merely incompetent or inept. On the flip side, they point to the failings of the competing programs as evidence of their inferiority. The vicious cycle is often repeated, animus is raised, and battle lines are drawn. In reality, different programs could indeed be very solid. How can that be, you ask? I will promise you not every one of those 10 athletes were equally prepared for what we refer to at The Ranch as “The Push”. Over the past 13 years, we have learned NOT to proceed without an assessment to assist us in knowing where each athlete currently is in several key areas. Simply taking time to assess, correct and prepare for “the push” before we actually push has made the average gains higher, the percentage of underachievers lower, and the injuries far fewer. Here are the facts as we see them. Every athlete must reduce/remedy his constraints before any velocity program can have its full effect. Failure to do so will minimize the athlete’s gains and could place him at significantly increased risk of injury. What are the common constraints? To read more, purchase the Feb. 26, 2016 edition of Collegiate Baseball or subscribe by CLICKING HERE. It includes a number of pitcher assessments that should be closely looked at before a pitcher starts a velocity improvement program. They include an assessment of pain, ability to bounce back, strength imbalances, levels of mobility, flexibility, among other crucial areas. In the last 5 years, not one of Ron Wolforth’s pitchers has suffered an elbow or shoulder injury due to this careful assessment. MONTGOMERY, Tex. — Velocity improvement programs are springing up across the USA as never before. 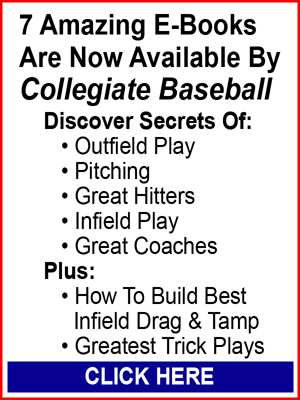 Many pitchers are being helped with these programs. But others simply aren’t ready for such grueling programs that put more stress on the elbow and shoulder than these young men have ever faced in their lives. The result has been a number of injuries which result in Tommy John and shoulder surgeries. Collegiate Baseball is aware of several college programs that have had numerous Tommy John surgeries in the past few years. It would be fair to say that injuries to pitchers are approaching an epidemic level from youth baseball all the way to Major League baseball. Incredibly, 878 professional players have had Tommy John surgery performed from 1974-2014. 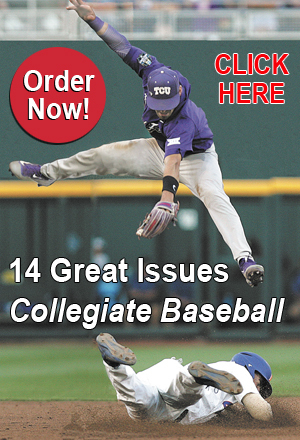 Collegiate Baseball printed an in-depth story in the Feb. 20, 2015 issue which was written by John Mugarian that gave strong evidence weight training for pitchers could be a catalyst for the explosion of elbow and shoulder injuries. Velocity improvement programs for those who aren’t ready for them could also be an issue as well. The obvious question is how can how can pitchers stay healthy but still improve their velocity? In the last edition of Collegiate Baseball, Ron Wolforth, owner of the Texas Baseball Ranch and originator of the Athletic Pitcher Program, delved into why a full assessment of each pitcher was necessary before they undergo a velocity program. Areas included an assessment of pain, ability to bounce back, strength imbalances, levels of mobility, flexibility, among other areas. Wolforth has been pushing the envelope with velocity improvement for the past 13 years with incredible success. Since 2003, 187 students have broken the 90 mph barrier while 28 students have eclipsed 94 mph and five 100 mph. Over 78 of his trained athletes have been drafted by Major League Baseball organizations. Having several different assessments are important for the health of the pitcher before embarking on a velocity improvement program, according to Wolforth. “There will be people reading this who will roll their eyes because they feel the assessment idea is overkill,” said Wolforth. “If you go into a doctor’s office because you feel terrible, he will do a series of assessments. 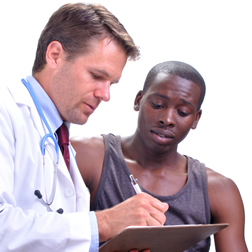 You will tell the doctor what medical issues you have as he looks at your medical history so he can give you sound medical advice to start you on the path of being healthy again. “The reason that assessments are warranted before velocity enhancement programs begin is that pitchers come to you at different places in life. “There are some who are extremely flexible and not very strong. There are some who are incredibly strong but not very mobile. There are people who have overdeveloped front sides because they have been lifting in a football weight program. Their pecs, delts and biceps are overdeveloped while their back sides are underdeveloped. “You have people who have constantly been throwing since they were eight or nine years old while some haven’t thrown much in the past year. Some will have a history of injuries while others won’t tell you about pain or injuries they have sustained if you don’t ask them. “All of these people show up at your door, and you will now put them on a velocity enhancement program. That’s a mixed bag. It behooves us to take some time to do a proper assessment. Wolforth said that since there are a lot of injuries to pitchers in baseball, he is often contacted from physical therapists around the nation who are working with 10-14 year old players that they didn’t see 10 years ago. “Although a coach can give a general assessment, it is wise to let the medical community use their expertise to make an informed assessment. I don’t try to diagnose that because it isn’t my expertise. “Since we have initiated our assessments at the Ranch, instead of 3-5 significant gains in a group of 10 pitchers, we are seeing 5-7 significant gains. More and more of our guys are making gains and are sustaining those gains. We have very, very few pitchers who go backwards. It is incredibly rare for that to happen. To read more, purchase the March 11, 2016 edition of Collegiate Baseball or subscribe by CLICKING HERE. It explains HOW to perform an in-depth assessment with pitchers prior to embarking on a velocity improvement program. The areas the assessment covers is obvious pain or soreness the pitcher currently has, strength imbalances, mobility and flexibility and mechanical efficiency. KNOXVILLE, Tenn. — The sad reality in baseball is that pitchers rarely hit their intended target. Collegiate Baseball ran an in-depth story about why U.S. Navy SEAL snipers can hit targets up to a mile away while pitchers struggle to hit their mark from 60 feet 6 inches in the Feb. 6, 2015 edition as the SEAL Sniper Training program was explored. According to Inside Edge, which compiles data from Major League games, pitchers on this level missed their target 76 percent of the time during the 2014 season. Inside Edge defines hitting a target as the catcher’s glove didn’t move or it was within one baseball width from the glove. A big difference between the two disciplines are that snipers look through a scope with crosshairs to target with precision, and their rifle is completely still along with the sniper’s body and head. A pitcher has many moving body parts as he throws a pitch, including his head, which obviously includes his sighting mechanism with his eyes. There has never been a method so pitchers could visually train with precision like a sniper until now. In part one of this series, internationally known archer Doug Besherse explained how aiming small and missing small must be utilized by pitchers from the time they are eight years old to train the mind properly. Anything less will not allow the pitcher to tap into his maximum control. In this final article of the 2-part series, Tim Nicely, inventor of V-Flex, has introduced a training aid that could revolutionize the way pitchers throw strikes with more precision. It essentially is a product that assists the brain in processing visual information more efficiently for pitchers. It allows pitch control through spatial learning. Nicely said that he became intrigued with the brain after his first cousin was seriously injured. “My first cousin suffered a serious brain injury in 1999,” said Nicely. 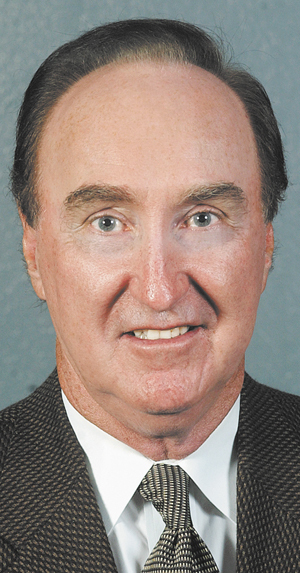 “I was working on the Tennessee Smokies’ baseball stadium in general contracting work and was coaching high school baseball and softball at the time as well. My first cousin fell from the roof of the stadium and suffered a massive brain injury. Nicely said that through his research, he found a number of areas that could help his first cousin. “I knew a lot about how the mind works after extensive research on the brain, building exterior confidence, visual strengthening and having a positive self image, among many areas that you hear today from vision experts and mind experts in the game. “That really didn’t alter the brain’s internal network like I wanted it to. When a person has a brain injury, they may not cognitively be able to do anything. You have to strengthen neural pathways without the mind’s help. That was my first order of business. “Could I exercise the brain so that it can show some progress? I didn’t look at it the way I normally looked at things. My first cousin was mentally tough. There wasn’t a more mentally tough person than this girl who had fallen. But she couldn’t pull herself mentally out of the brain injury. It took stimulation of the neurons. “The devices I began to think about and contemplate were original. I had an epiphany moment four years into the research. I wanted to know how electricity acts inside the brain. 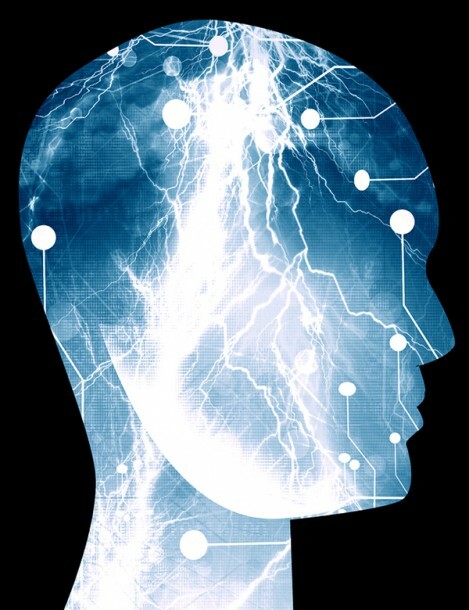 Does electromagnetic energy hold the same properties inside the brain as outside the brain? I wanted to create a better conductivity ratio in the brain. I knew if we could increase the electromagnetic forces within the brain, then the brain could physically exercise. Nicely, a former pitcher in high school who played shortstop and second base at Middle Tennessee State University, said he is aspiring to strengthen the brain of pitchers in the quest to throw more strikes. “Right now, we are setting double digit improvement with pitchers hitting their target. Obviously, the ability to throw strikes will be different on the Major League, college and high school levels. But we are seeing anywhere from 10 percent to 20 percent increases in strike throwing. Keep in mind we are in the infancy of our data collection for pitchers. After Collegiate Baseball ran the article last year about U.S. Navy SEAL snipers and the level of success they have at hitting their targets, several coaches called us to inquire if there were any glasses that a company made that had crosshairs in it so pitchers could look at their target like a sniper. We weren’t aware of anything on the market like this, but we inquired with several scope manufacturers. And in each case, they didn’t have anything that remotely resembled this. Ironically, the V-Flex system for pitchers was introduced shortly after the story appeared. 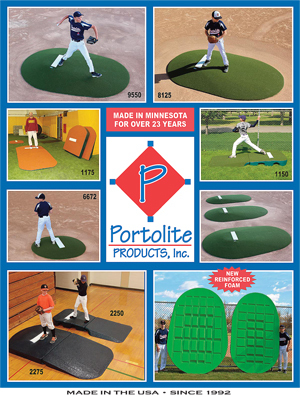 The system for pitchers includes three progressively smaller circles strategically placed in line from the the pitcher’s rubber to home plate. The smallest circle is on home plate. The next largest circle is 12 feet from home plate. And the largest circle is 20 feet from home plate. Depending on the height of the pitcher, usually the only circle that will move is the largest one if necessary. If a pitcher has an big breaking curve, the two largest circles can be moved slightly to accommodate the trajectory of that pitch. But the smallest circle remains in place on home plate as the curve ball ends up at home. 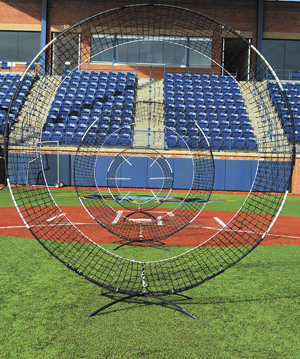 “Pitchers will get a great feel for breaking their curve ball at a specific spot so that it breaks into the strike zone at the ideal spot they want,” said Nicely. To read more of this article, purchase the Feb. 26, 2016 edition of Collegiate Baseball by CLICKING HERE. Nicely explains how advanced depth perception is attained for pitchers with this device as the strike zone becomes darker and brain recognition is achieved in 4-D. He explains how professional pitchers are having great success with it and why the “feel system” of throwing is simply not effective. Nicely feels that pitchers will ultimately be able to throw 70-80 percent strikes because of this technology.